CBSE conducts the Class 10 examinations which begin in March. All examination questions are asks from NCERT Books so students need to be conscious of any updates that are made by NCERT. 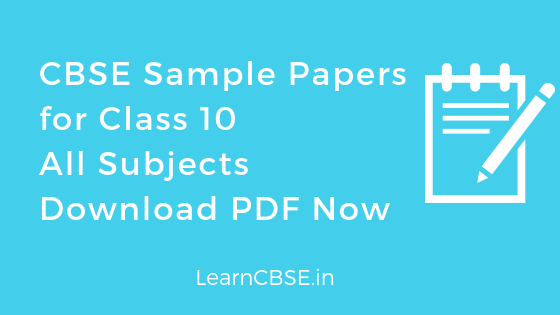 For the examinations, students can also download the CBSE board sample papers for class 10 free PDF download and practice solving problems can improve your score. By practicing the CBSE sample papers for class 10 Maths, students will learn how to determine question paper patterns and tendencies, answer requirements, forms of trick questions and more. Students are encouraged to try sample question papers within the designated time limit. The papers permit the student to find the ideal method and solutions for commonly asked questions. Students are encouraged to solve all of the questions within the prescribed time in order that they might evaluate their areas of strength and focus on those they are weak in. To attempt board exam students expect a lot of practice in the form of mock tests and sample papers which will prepare and allow them to write the Class 10 CBSE Board Examination with confidence. Since it’s the first board examination a child appears for there is often lots of apprehensions involved. Solving these sample papers boosts confidence and alleviates the anxiety of board examinations that a lot of students have. Subjects – Maths, Science, Social Science, English, English Communicative, Sanskrit, Computer Science, Languages, Accounts and Vocational. We hope the CBSE Sample Questions papers for Class 10 for all subjects, help you. If you have any query regarding Sample Questions papers for Class 10, drop a comment below and we will get back to you at the earliest.